An amazing lifestyle can be your reality, as soon as you want it to be - but without the price tag! If we’re going to help you live an inspired and styled life, then we have to always be on the lookout for the best experiences – from great food, travel, culture and beauty services – anything that says lifestyle. But what if you could find this all in one place? Exclusive daily deals across a number of categories and can set preferences to see more of the deals you want. Let me introduce Amazon Local - the site that brings you a curated selection of great food & drinks, entertainment & travel, health & beauty offers. Whether you’re looking to discovery awesome local experiences or discover destinations near and far, Amazon Local have some of the best ideas from merchants near you. No matter where you want to go or what you want to try, Amazon Local can help. 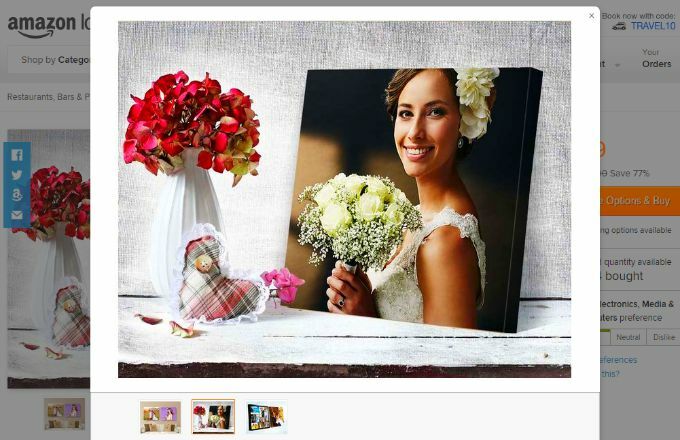 And the best part is that you can save up to 75% on local products, services and experiences like the custom canvas print featured above by Canvas Focus. If your schedule is as busy as mine and you're not able to fit in a full vacation, now may be a good time to check out the offers in your area and book a fabulous staycation. You'll feel a world away, close to home. Go ahead! I challenge you to escape with Amazon Destinations to that bed-and-breakfast getaways, find your bliss with that reflexology treatment, and place a reservation with that gourmet restaurant and let someone else do the cooking. So, the next time you're looking for restaurants near you that you haven't tried or trying to figure out what to do - just visit Amazon Local first. And remember... the same is true for a variety of US cities! Have you ever tried Amazon Local? This post includes affiliate links which may yield a small commission if you make a purchase.